BoxiePro is the world's first cat litter to eliminate 100% of the bacteria from the litter box. It keeps itself clean and fresh 24/7, even when your cat isn’t using the box! BoxiePro Deep Clean eliminates germs in the litter box so your cat won’t track them throughout the home. By wiping out harmful bacteria and odors in the litter box, BoxiePro keeps your cat and home cleaner and healthier. BoxiePro addresses a concern in the back of every cat lover’s mind - what germs does a cat track out of the litter box? As our newest litter offering, BoxiePro assures you will have the cleanest litter box experience by preventing unseen bacteria and odors in the litter box from being tracked throughout the home. How do we do it? We use natural probiotics! In third party lab tests, BoxiePro™ probiotics eliminated 100% of bacteria in the litter box. By controlling what is in your litter box, we help keep your home safer and more hygienic for your family. Are you ready to level-up your litter? Don’t just scoop - BoxiePro keeps your litter box cleaner than scooping alone. BoxiePro litter includes all the great benefits of Boxiecat’s classic formulas. Hard Flat Top™ clumps form instantly on the top of the litter box, rather than soaking to the bottom, making it easy to scoop and keeping the litter box ultra-clean throughout use. BoxiePro achieves incredibly low dust levels with an advanced dust suppression process. It eliminates ammonia odors and is hypoallergenic. BoxiePro litter is soft on cat’s paws and resists tracking. 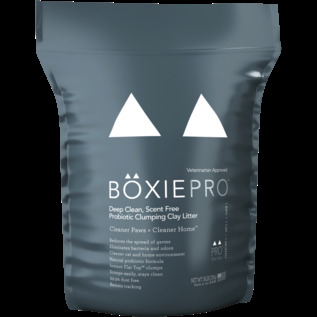 Because BoxiePro stays so clean and forms smaller and lighter clumps, it is also longer lasting. One 16-pound bag lasts one cat approximately one month. It is perfect for single and multiple cats and all litter box types. Cats take to BoxiePro right away, and it helps attract cats to use the litter box. BoxiePro litter is ideal for pet parents who recognize the effectiveness of clay but want a healthier and better performing option. 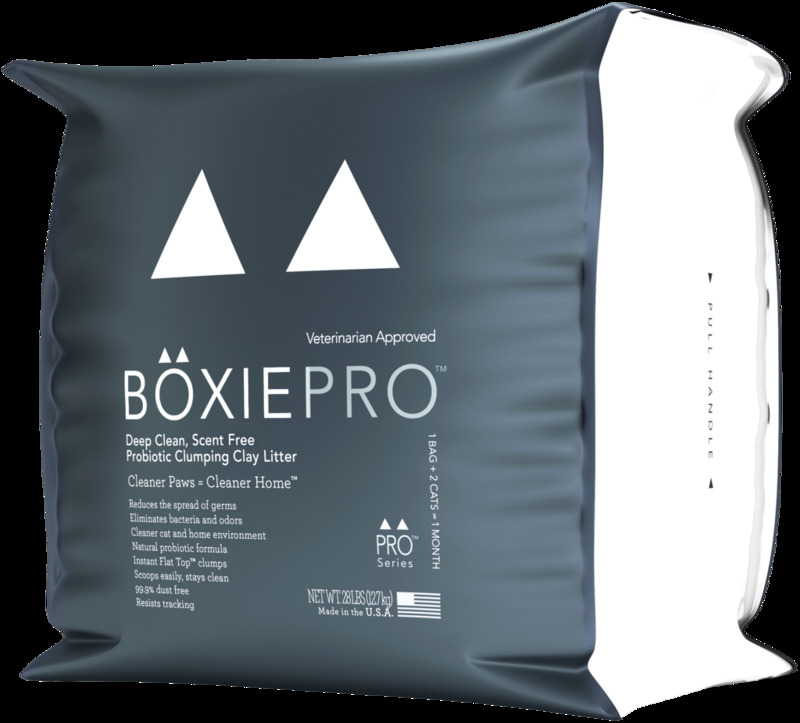 Veterinarian approved and winner of the Cat Fancy Editors’ Choice Award, BoxiePro litter quality makes a noticeable difference. 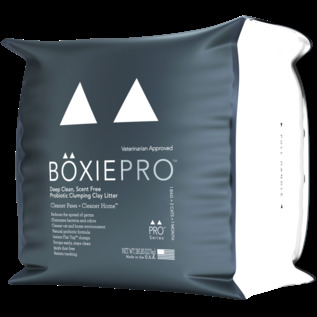 BoxiePro litter is made in the U.S.A.
For more information, please visit BoxieCat.